Take a behind-the-scenes look at SI.com's all-day access to Nike, Jordan and adidas' sneaker events across New York City. December 1, 2016 proved to be a special opportunity for The Crossover's resident sneakerhead. Jarrel Harris attended three different events in the span of seven hours, going to Nike, Jordan Brand and adidas festivities. Harris, who lived out every sneaker lover's dream, documented his journey. I had an early wake-up call at 6 a.m. to preview the new Nike SoHo space where I would be trialing a pair of the Nike HyperAdapt. The HyperAdapt is one of the most anticipated sneaker releases of the year due to its innovative auto-lace feature. The first thing you notice about the Swoosh’s new flagship store: It is enormous. The space occupies five multi-sport floors and will become the hub of all Nike and Jordan releases. The space will also be used for Nike athletes and entertainers to visit and greet fans. After arriving, I was ushered into a locker room with my name on a bag full of training gear. I then hustled back downstairs to the group where we met and spoke with Nike’s Senior Innovator and HyperAdapt creator, Tiffany Beers. 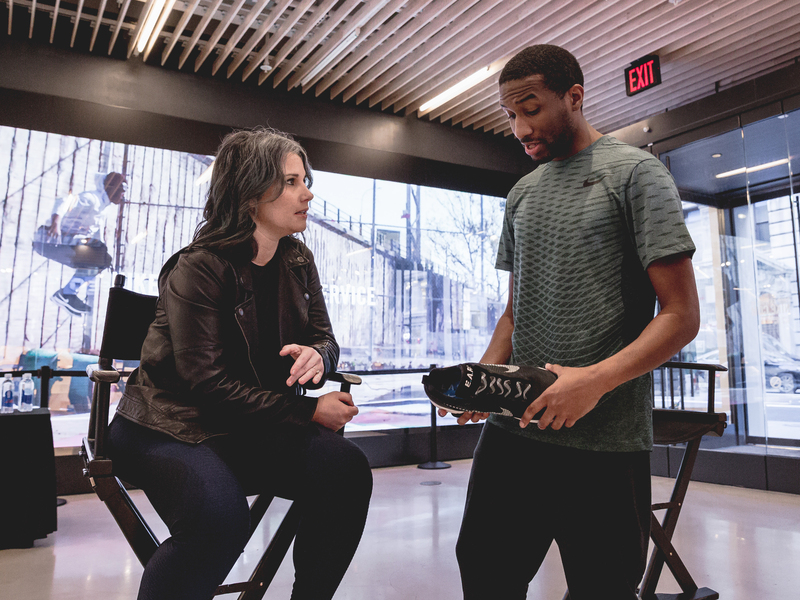 Beers dropped some great anecdotes about walking around the Nike campus three years ago in an all-black sample pair of the HyperAdapt while trying to keep her project a secret from her coworkers. She also mentioned meeting with different professional athletes who tested the shoes. They were amazed, but Beers told them not to tell a soul. Beers then went on in detail about how the sneakers works. “When you step in, your heel will hit a sensor and the system will automatically tighten,” she explained. “Then there are two buttons on the side to tighten and loosen. You can adjust it until it’s comfortable.” I spoke to Beers in a Facebook Live a few months back as I tried on the Nike Mag for the first time, so I was psyched about trying on the HyperAdapt. In 2013, Beers and legendary Jordan designer Tinker Hatfield worked on different prototypes and trials to break ground on the auto-lacing tech. The mission was to celebrate the Nike Mag’s fictional release date (Oct. 21) in Back to the Future II The project then inspired the completion of a more technical, sport version they’d originally conceived, the Nike HyperAdapt 1.0. After Beers finished her Q&A, Nike workers then proceeded to hand us large futuristic boxes that housed the sneakers. 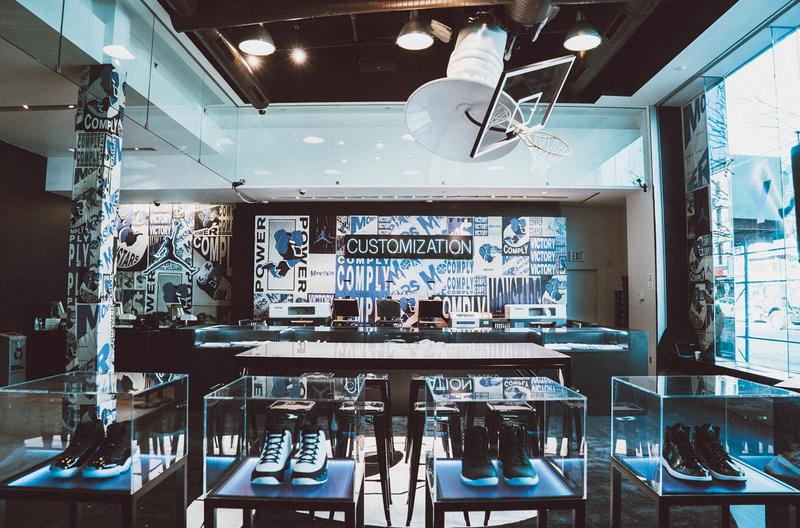 We then headed upstairs to the Nike+ basketball trial zone where consumers could come in and try basketball sneakers before purchasing. We participated in a light warmup and were broken up into groups of three where we would take part in three different workouts while wearing the HyperAdapt. The first workout of the morning focused on testing the shoes’ traction in a series of layup and dribbling drills. Performance wise, I was taken aback as the sneaker exceeded my expectations. They were comfortable to hoop in and I didn’t have any problems trying to Euro step on every layup drill. The best part was that we could adjust the sneaker anytime—if it was too tight just press the button. If we needed more of a snug fit, just press the button. It was that simple. With a few slight tweaks, I could easily see these on an NBA court in the near future. Next we proceeded to the treadmill where we had a virtual run in New York’s Battery Park alongside Nike’s winning Olympians. It has been years since I last touched a treadmill but the virtual experience was pretty awesome. After hopping off, we headed upstairs for the final workout on the soccer-floor turf where they tested our agility skills. The intense training here was the hardest part of the HyperAdapt trial. After the training ended, the heartbreak came—we had to return the shoes. The sneakers were going on sale in a few hours at a retail price of $720. The pain in my face tells it all. After getting dressed I noticed that it was 9 a.m and I had to be at my next event in a half-hour. I ran to the subway (which is a workout itself!) where I took the D train to the new adidas New York City flagship store on 46th Street and Fifth Avenue. The first thing I noticed was the huge line outside the store with people waiting to get in. The store was officially opening within the next hour and I was invited to a preview along with the opportunity of interviewing any athlete there, which included Titans running back DeMarco Murray, U.S. National Soccer Team captain Becky Sauerbrunn, Houston Astros shortstop Carlos Correa, New York City FC captain and international legend David Villa and New York Red Bulls midfielder Sacha Kljestan. The new location marks the largest adidas store in the world, which is four floors and features a lower level that all together takes up 45,000 square feet. The new building reinforces adidas's commitment to having a strong presence in the U.S. The brand is investing a lot in this space and the people of New York City. 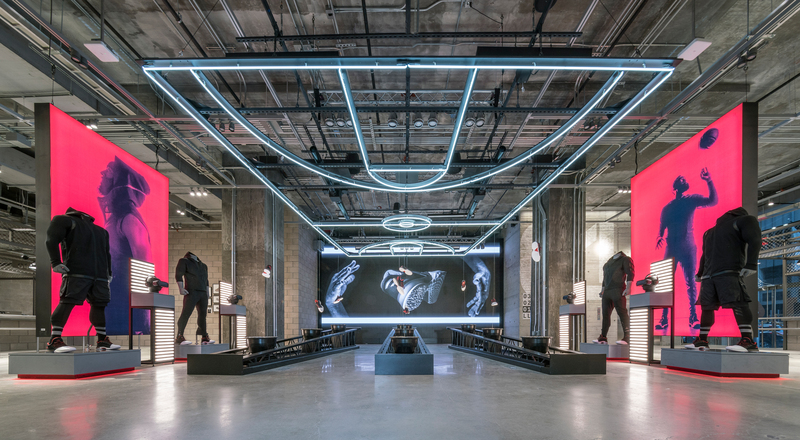 While both the adidas and Nike spaces are huge, the stores were designed in a much different manner. The new adidas store had more of an urban vibe as it was inspired by high school sporting stadiums. 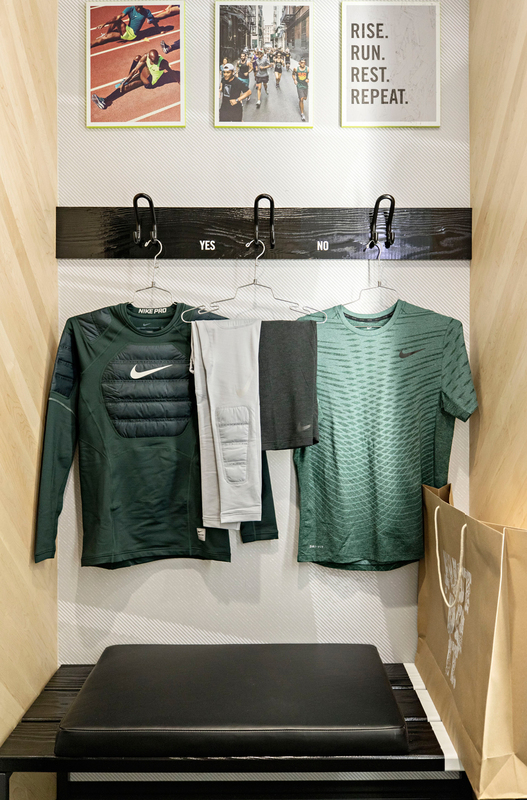 The store features a tunnel entrance, seating for live-game viewing on big screens, locker rooms instead of dressing rooms and track and field areas where consumers can test and experience products. James Harden’s signature sneakers the Harden Vol. 1 sneakers hanged in one section as customers could purchase them for the first time in person. The adidas athletes were welcomed into the store by a high school drum line. I then headed upstairs to interview Houston Astros shortstop Carlos Correa about his partnership with adidas. He then posted this picture on Instagram. To note—my recorder is fine. After I finished my interview an adidas PR rep told me to come back in the afternoon because a few Knicks players were coming to visit and surprise customers—Derrick Rose, Kristaps Porzingis, Joakim Noah, Kyle O’Quinn and Willy Hernangomez. Derrick Rose got a lot of love at the @adidas fifth avenue launch. As badly as I wanted to stay and have a chance to chat with Kristaps, I needed to head to my next event which was located in Harlem with the Jordan Brand. The event provided an exclusive preview of a custom Space Jam brand space with themes from the film. Before any of that, I did have to stop at Chick-Fil-A for a quick lunch. I needed fuel. I got off the train and headed to Foot Locker’s House of Hoops. The store was Space Jam’d out and the location went so far as to provide a large satellite on the roof. Once inside, we were greeted by one of Foot Locker’s store managers where he gave us a tour of the unique space. 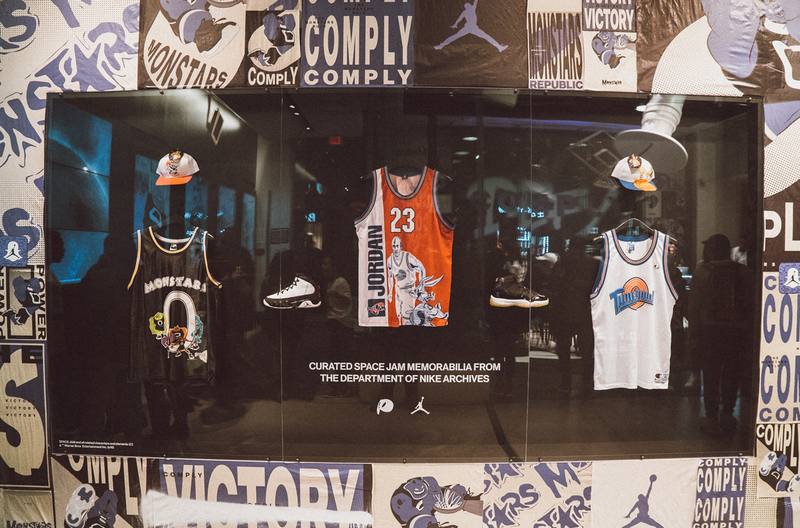 On display were some cool Space Jam memorabilia such as original concept jerseys from the movie and a sneaker lineup collection (Air Jordan XXXI “Space Jam,” two original pairs of Air Jordan’s worn in the legendary film—the Air Jordan XI Retro and the Air Jordan IX Retro—and the Air Jordan 1 (Space Jam themed) high. We then had the opportunity to customize our own Space Jam jerseys. “Space Jam.” We were ushered into all black vans with boxes of sneakers. I felt like we were a part of some secret sneaker society. As we were on our way to the gym, this is when I started to feel the effects of the Nike workout from the morning. We arrived at Terminal 23 around 2 p.m. and headed into the locker rooms where we found our names and jerseys to change in. The court was transformed into a Space Jam haven of course. Having played in the Air Jordan XXX1 already, I knew what to expect performance-wise. The sneaker features the iconic Jumpman logo and a faded Swoosh to pay homage to the Air Jordan 1. It is definitely one of the greatest sneakers I have ever hooped in and highly recommend getting a pair. I dreaded the mini-workout prior to playing since I was already warmed up and didn’t want to waste my last bit of energy running sprints. We then played four or five games of five-on-five. I am pretty sure I played with the right-handed version of James Harden. We lost almost every game until the adrenaline kicked in and I made a few buckets to win our last game. Prior to leaving, I received the greatest gift ever that made a childhood dream come true—the “Secret Stuff” bottle from the “Space Jam” movie. With all four events in the book, the day was sadly over. As I headed home, my mind was more focused on sleep than sneakers. The day was over, my dreams were fulfilled, and my closet was significantly fresher.